PATTAYA:--The director-general of the Department of Marine and Coastal Resources toured Pattaya Beach to witness the damage caused by the city’s poor flood management. 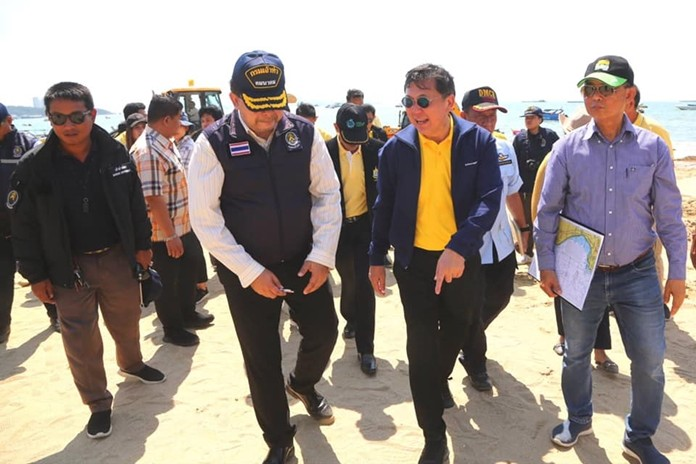 Jatuporn Buruspat was escorted to the hardest-hit area of the beach at the foot of Soi 6 by deputy mayors Pattana Boonsawad and Banlue Kullavanijaya as well as regional environment and marine officials. Jatuporn demanded answers as to how Pattaya will prevent the massive damage caused by just two hours of rain from reoccurring. No answer to that one, because everybody knows that next time we have a goodly amount of rain, exactly the same thing is going to happen. Foresight, in laying adequate drainage before dumping the sand down would of course have alleviated the problem, but that would have required thought, which doesn't seem to occur too often round these parts. I believe the answer to the problem lies right there, poor flood management. It has ever been so, and given it is unlikely to change, I hope the officials told him that next time it rains heavily, the beach is almost certainly going to head out to sea again. Truth is a bitter pill to swallow though, so they probably gave him vague assurances that they have things under control, a lie which will be exposed as bare as the beach, with the next downpour. All just sand pies and lies will just have to settle for a 3rd world beach in a world class location bring in some new dancing girls and no one will care. One would think a person in his position would know the answer to the beach problem. 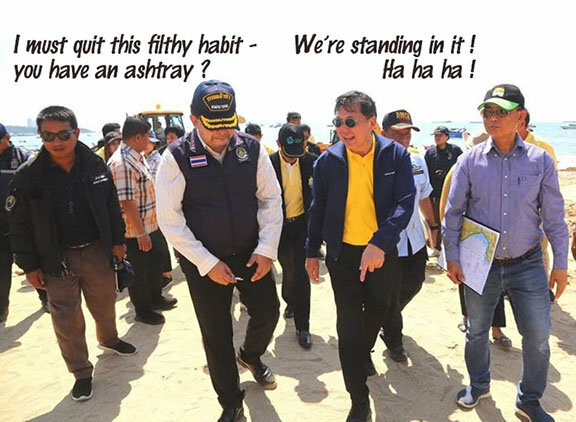 I do like the way his offsider is using the finger " And this is where we put the sand, prior to the thieving tourists taking it "
Something tells me Khun Jatuporn Buruspat hasn't had a cut of the 400 Million budget as yet. I would say if that situation is not rectified heads will roll. just two hours of rain from reoccurring. it just recurred an hour ago. since we are now entering the months of rain and storm, it's only going to get worse and more embarrassing for the authorities and more interesting and entertaining to watch for the general public. It's like watching a slow motion train crash. Better than a Netflix disaster movie. He has got a fat chance of getting any answers out of Pattaya Mayor Sontaya Kunplome. He was appointed by PM Prayut and is one of Prayut's political allies. 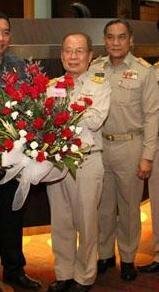 A quick phone call to Prayut will soon get Jatuporn off his back. Surely he is not smoking on the Beach, we all know this is not allowed and he must be fined 100,000 baht.